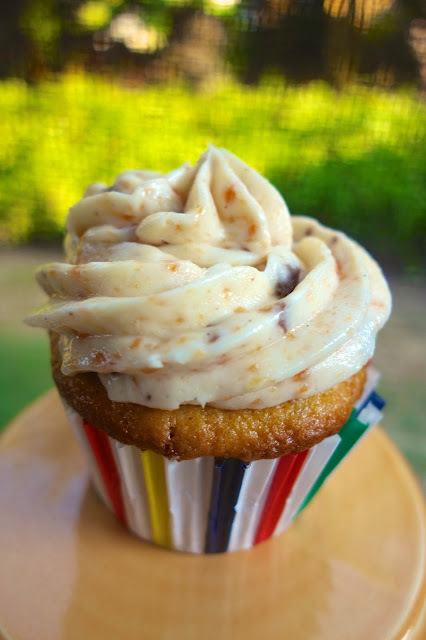 Butterfinger Cupcakes - yellow cake loaded with Butterfinger candy bars topped with a homemade Butterfinger buttercream. These cupcakes are sinful! I had zero self-control around these cupcakes. SOOOO good! 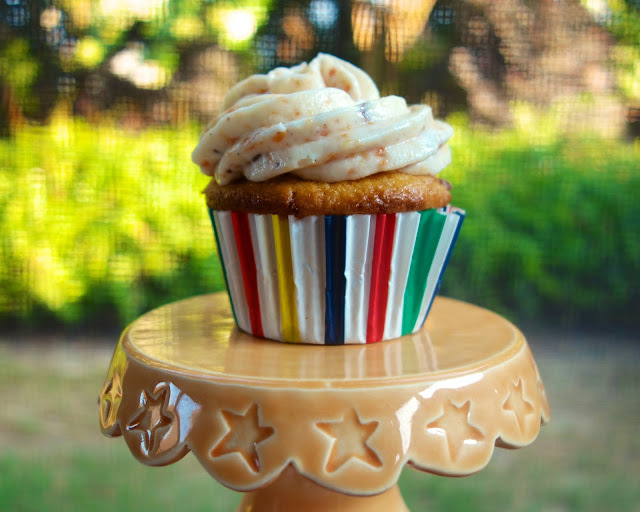 Run, don't walk, to the kitchen and make these cupcakes! Chicken Legs took one bite and said they were the best cupcake I've ever made. That is one heck of a statement coming from him! 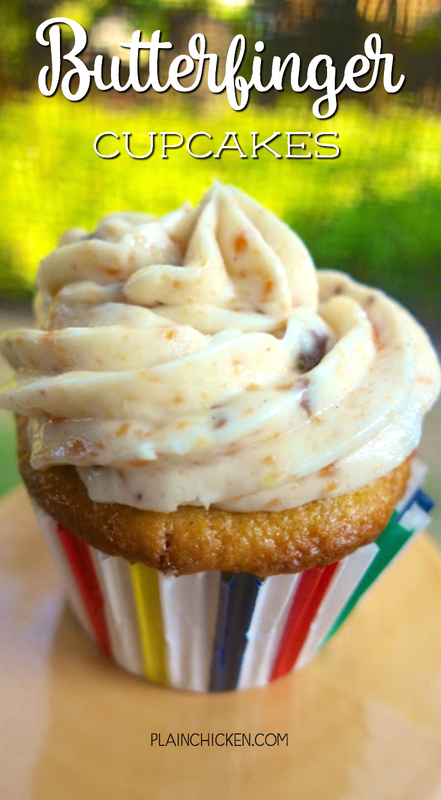 These cupcakes are loaded with Butterfingers. I happen to LOVE Butterfingers, so that isn't a problem for me! I cheated and used a cake mix for the cupcakes. I made my favorite buttercream frosting and added crushed Butterfingers. Sinful! We could have eaten all 24 in one night, but we decided to give most of these away to friends and family. Here is a tip for crushing the Butterfingers. I froze the Butterfingers for about 30 minutes and transferred them to a freezer ziplock bag. I hit them with my meat pounder. They were crushed perfectly! Prepare cake mix according to package directions. Stir in 4 crushed butterfingers. Pour batter into lined cupcake pans. Bake according to package directions. Cool completely. To make the buttercream: In the bowl of an electric mixer fitted with the paddle attachment, cream butter until smooth and creamy, 2 to 3 minutes. With mixer on low speed, add 6 cups sugar, whipping cream, and vanilla; mix until light and fluffy. Stir in 3 crushed Butterfingers and mix on low for 1 minute. If necessary, gradually add more powdered sugar to reach desired consistency. Sounds delicious! Just checking, is this 7 full size Butterfingers that you use in the recipe? your printable recipe page isn't working..
Lynne - I fixed it - thanks for the heads up! I swear that everything you make looks like the best thing I've ever seen in my life!! My daughter is a Butterfinger freak. We just might have to make these for her b-day next month. Thanks!!! I'm definitely pinning these cupcakes! I am a sucker for Butterfingers!! Pinning to my Cupcake board. This is wrong - SO wrong. But yet so right...I might have to make these for my birthday next month. None of my friends bake, so if I want a homemade treat, it's up to me! Whoa girl!! These sound so amazing. These looked so yummy I had to post them in my Share the Love post today! Thanks for all the great recipes! These look fabulous!! I will make them for sure! An update to my previous comment - I made these for a fundraiser bake sale at my office this week; they were a HIT. I had several people ask for the recipe; I pointed them to plainchicken.com! Do the butterfinger pieces not get clogged a little in the decorating tip . I want to make them but wasn't sure. mine did not get clogged. Enjoy! Do you have to refrigerate them since the icing h whipping cream in it? You can, but it isn't required.